Sean was a big, beating heart in our multi-heart world. Sean was flesh and blood and bones. Sean was patience with small children. ‘Sean was life’. Yes, indeed, that encapsulates it all. Lovely photo of brother and sister. I was looking at our old family pictures earlier today. So, I see this photo with a heightened sense of precious times spent together. Again, thanks, Shermeen. 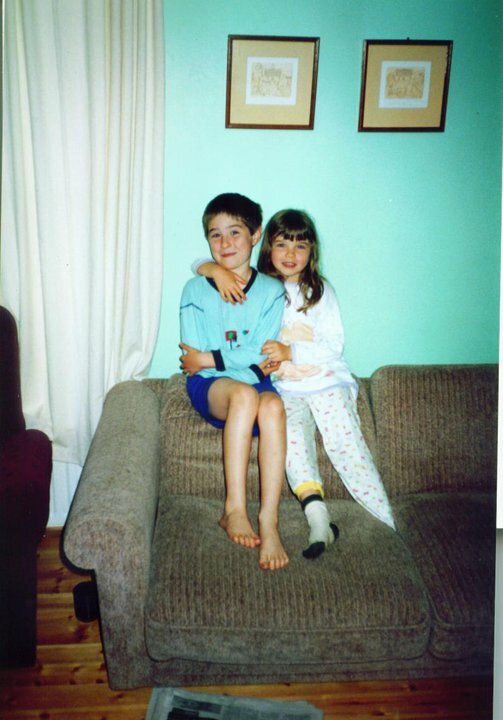 Luckily we have lots of photographs of S & S as children at all ages. I have hardly any of myself or my family when I was young … it’s good that times changed in that respect. Brendano – this is marvellous, so refreshing, so alive, so bright. I loved reading through, again and again. I shall keep it memory of Sean. I picture Sean racing down that school corridor with a chum at his shoulder! I’m glad you liked it, PG … I’m sure I’ll keep adding to it as more words pop into my mind. I’m in the throes of ballad group practice once more, by the way … the competition is coming up soon. Good fun. And a beautiful picture of your children. Thank you, PapaG … you’re very kind. Your wife and Kojo must be due home from their holiday any day now? They arrived yesterday morning. The house was clean and tidy. My wife was well impressed and I had tears in my eyes to pick Kojo up. I had kept the artificial Xmas tree for him for him to open his Xmas presents on Feb 1! It was worth it as he loved the lights and decorations. A picture will be sent to you! That’s wonderful! What a great morning it must have been. You have indeed, making the picture fuller and more colourful. May your multi-heart world ever be tranquil and happy. Thanks very much, Shermeen, and I wish you the same. I have been following all your posts and this one particularly made me realise that I feel the same way about my children. They are love and life. I was reading this earlier, and although it is a very different situation, I think you may find it interesting. Hello Araminta. Thanks for this – I did find the Parris piece interesting, and a lot of what he says does apply to our situation. I’m editing a book on stress management on the moment. On grief, it makes the point that it’s not the case that ‘time heals all wounds’ … it’s what the grieving person does with the time that’s important. We had already realized this, and have several projects under way intended to allow us to make progress in our own lives. We want to develop our own potential and make Sean proud of us, if he can see us. Hi Shermeen. Yes, thanks Ara for posting the Parris article. It is well observed and well written in plain everyday words. I too find the piece helpful when recognising the absence of my parents. Perhaps as love binds us together, so loves binds us apart? I posted the link because I found it helpful too. It described my feelings when my father died, so I’m pleased you all found something in the writing with which to identify. I thought it was extremely well written. People do react very differently to loss, but I certainly recognised many of the emotions he described. Your love shines brightly, Brendano. It is a strong and steady flame. Thank you, Cymbeline. Yes, my love for Sean is very strong.